In this section of religions in Kerala, we have discussed various religions of Kerala. Religion holds an important part in the social life of Indian people. 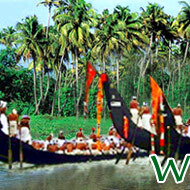 India is a multi-religious country and the same aspect is reflected in the social and cultural fabric of Kerala. 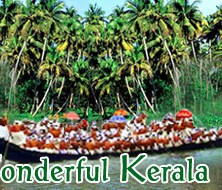 There are mainly three religions observed in Kerala - Hinduism, Christianity, and Islam. 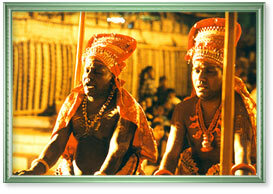 The oldest of all the religions practiced in Kerala is Hinduism. As far as the religion of Kerala is concerned, the origins can be traced to Hinduism. Later on religions, like Islam and Christianity, with their various sects came into the scene. Other Indian religions like Buddhism and Jainism had some influence among the Hindus and were found scattered with their migration to Kerala. According to 2001 Census of India figures, 56% of the Keralite population consists of Hindus, 24% Muslims, 19% Christians, while the remaining 1% constitutes other religions, like Sikhism, Jainism, Buddhism, and Judaism. The earliest settlers in Kerala were Proto-Australoids, the Mediterranean, Dravidians, with the most recent being Aryans. Hinduism is a way of life and is based on the belief of Sanathana Dharma. The Hindus worship the Supreme Being under three forms: Brahma - the creator, Vishnu - the savior, and Shiva - the destroyer. The mark of Hinduism can undeniably be visualized in the culture of Kerala. It is believed that many saints and movements originate from here. Though, a little surprising is the fact that many of the religious practices are unique to Kerala and are not followed in other parts of the country. Although the Hindus in Kerala are divided into few castes, the region of Kerala was also the first to allow Hindus of any caste to enter and worship in temples. Muslims in Kerala are generally referred to as Mappilas or Moplahs and Islam is believed to have entered India through Kerala. 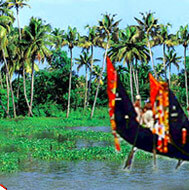 There are historical records of commercial trading between Kerala and Middle East during 7th century AD. The Jews and Arabs of the Pre-Islamic period were among the pioneers of spice trade with Kerala. Islam was also practiced by these traders from Middle East, who later settled in the coastal belt of Kerala. To this day, Muslims are highly expert in trade and commerce and as anywhere else in the world, are a close-knit unit with a clear-cut religious and political agenda. A significant population of Muslims lives in the Kozhikode and Malapurram districts of the Malabar region. It is believed that St. Thomas, one of the Disciples of Christ landed near Muziris (a famous port in ancient times) in 52 AD and established 7 churches, 4 of which exist till date. Today, there are five distinct branches of Christianity in Kerala - the Roman Catholic Church following Syrian, Latin or Malayalam liturgies; the Mar Thomas Syrian Church; the Orthodox Syrian Church; the Church Of South India; and the Nestorian Church. However, despite being a heterogeneous group, the Malayali Christians live in unity and harmony, finding comfort in common history and faith.